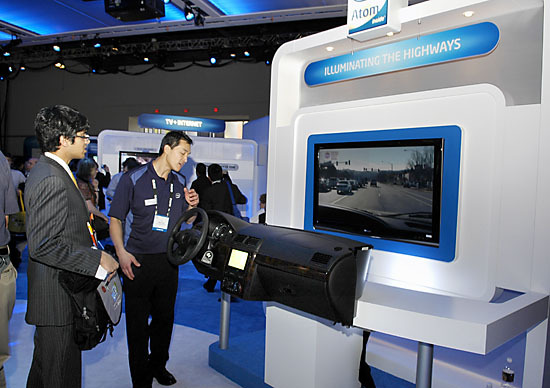 An interesting demo at Intel’s booth was an LED based communications system for cars. Intel demonstrated the idea of sending data via the LED lights currently used by cars for headlights and taillights. By modulating the frequency of the LED light, data can be sent to a basic receiver located either on a car or other device. 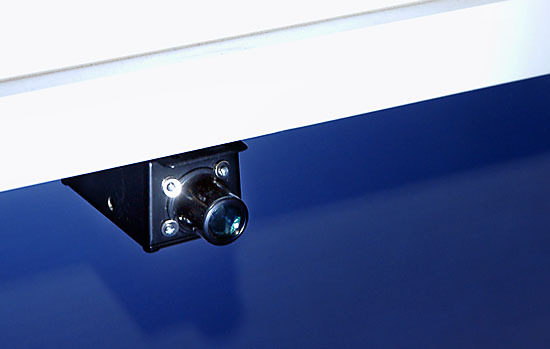 Since modulating the LED frequencies and capturing it remotely are all technologies that are currently available off the shelf, the cost of implementing the system is low. Intel gave a few examples of how this system could be used. Say the car in front of yours with this system in place applied its breaks (hence illuminating the LED brake lights), data embedded in those lights can be sent to your car and processed by an onboard computer (powered by an Intel Atom, of course). The computer could then either warn you that the car in front of you is slowing down or even apply the brakes for you. Another example given was your car communicating with a drive-through window at a fast food restaurant. As you approach the drive through, you car’s computer can pull up the menu and you can order your items directly from your car. Intel says they are currently working out some of the kinks and talking to automotive manufacturers to gain support for the system. "The Imagination Technologies staff also ran a dual stream video decode demo where they had a Atom/Poulsbo netbook playing one 8Mbps H.264 video and a 1080p H.264 video on an external display, simultaneously." I thought Poulsbo could only output 1366x768, so it's not outputting 1080p anywhere. "Intel gave a few examples of how this system could be used. Say the car in front of yours with this system in place applied its breaks (hence illuminating the LED brake lights), data embedded in those lights can be sent to your car and processed by an onboard computer (powered by an Intel Atom, of course). The computer could then either warn you that the car in front of you is slowing down or even apply the brakes for you." I just wanted to say that this is going to present major problems. People will get used to auto-braking and the sound that tones when someone in front of you brakes. Ice over the sensor or headlights, a dead sensor, or a dead pulse switch is going to leave you in the rear-end of the car in front of you. Re: "The SGX543 will probably show up in designs in about 2 years." That Sony netbook doesn't even look very good IMO. I like the look of that new HP Mini a lot more.